Team Essential : Essential Baits, Quality with a BIG difference! Experience, knowledge, loyalty and integrity – these are the 4 major components I look for when choosing team members to represent Essential Baits. You won’t find any of these guys jumping from one company to another just to get their next cheap bait deal, which is so often the case with many, so called, ‘field testers!’ They choose to use Essential Baits simply because they are 100% confident they are using best quality bait available and one that has been proven for well over 30 years. Strength in depth is the key and in terms knowledge, experience and ability, few could argue that we don’t have the very best bait team in the country, but more importantly, they go fishing for one reason only ... ‘Passion’ Mike Willmott, Essential Baits, 2018. Mike's incredible ability to catch carp on a regular basis, coupled with his awesome photographic skills have turned lots of heads in recent years and many fellow anglers had him down as their 'carp angler of the year' in 2017. Mike is a valued member of the Essential team and catches some of the most sought after carp in the country on a very regular basis from some highly pressured venues using Essential Baits to help him achieve his success. He enjoys his fishing with a passion for all the right reasons and just wants to go out and catch some of our best looking carp and rare visitors to the bank, knowing full well he is using the best quality bait available. 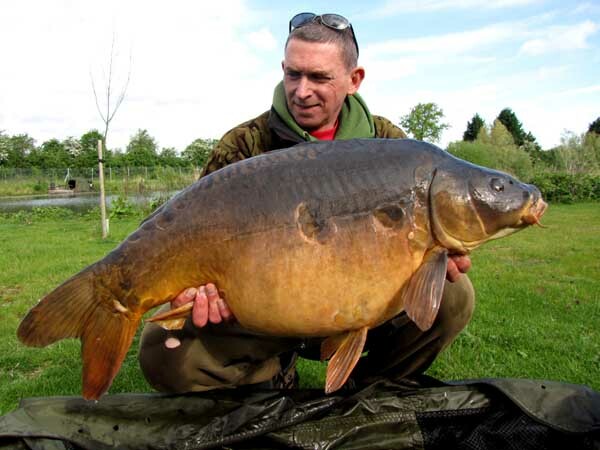 Mark is a long-standing user of Essential Baits and is a highly respected member of the Essential Team. 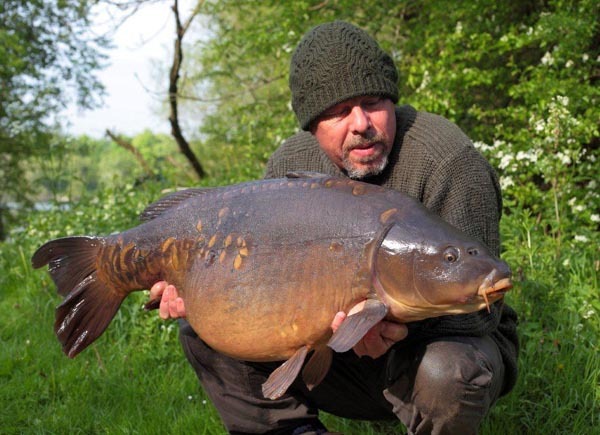 Over the years, Mark has caught an enviable amount of big carp, including a hat-trick of UK 40's on the B5, however, his ability to catch big carp doesn't stop on home soil. 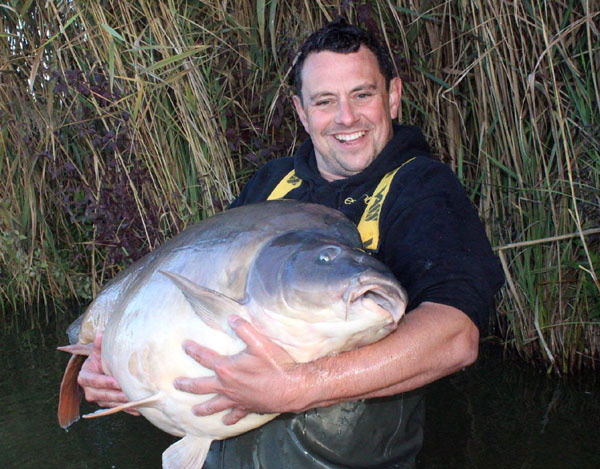 He was recently awarded the Continental Carp Catch of the year award by Carp-Talk following his incredible brace of 80-pounders from Les Telliatts in France, weighing in at 83lb 8oz and 83lb 12oz respectively! Once again, the B5 being responsible for yet another historic brace and further proof that this bait has no equal when it comes to catching big carp on a consistent basis. Rick has been a consultant for Essential Baits for many years and catches an impressive amount of big UK carp on a regular basis. He is a very well respected angler and contributes regular articles to various magazines and websites. Confidence in a bait is key for Rick because like most of us, he holds down a full time job and has limited time availability, therefore he wants no doubts in his mind. This was proved recently when he tackled the notoriously difficult 'Nutty Lane' venue in search of the elusive big mirror known as 'Daisy'. 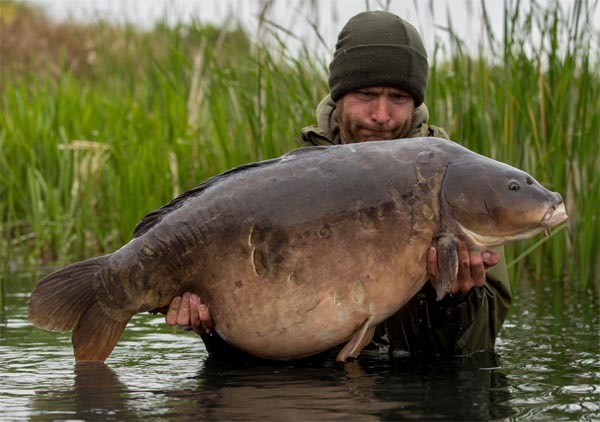 Despite only having a handful of carp amongst 16-acres of water, Rick applied the B5 for several days before his campaign and after just two nights fishing, he banked the big girl at a weight of 48lb 8oz! When people talk about old school experienced anglers who know a thing or two but keep completely under the radar, they don’t get much more ‘secret squirrel’ than ‘Big Jim’. He appears in Rod Hutchinson’s early carp books when they were close fishing companions and since that time he has had an incredibly successful angling career, catching stacks of UK monster carp to well over sixty-pounds. 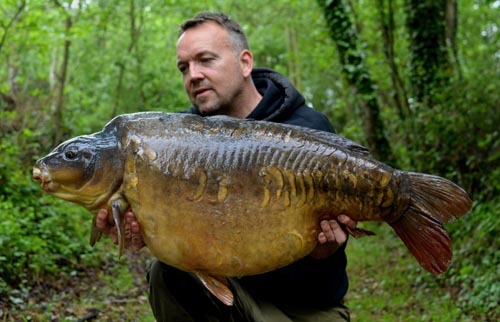 He is without doubt one of the UK’s most respected ‘underground' carp anglers and the fact that he chooses Essential Baits is testament to the quality and consistency of our range, because believe me, Jim has never been interested in something that’s second best. Clint has had an amazing 12 months since switching over to Essential Baits and has landed no fewer that 5 different UK 50’s on the B5 during this time! Catching big fish on a regular basis from venues that see lots of angling pressure and a vast array of different bait, demands a great deal of effort, sacrifices and 100% confidence in your chosen bait. If there's one bait that stands out from the crowd and consistently produces the goods when fished alongside other baits, it has to be the B5. 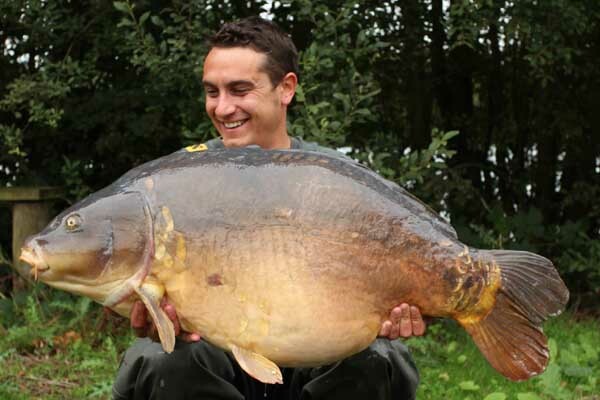 However, it not only has to compete with other baits, but also with the carp's natural food availability, and Clint has proved time and time again that the B5 will consistently produce the goods, long after other baits have stopped working. Rob joined our team because he felt his results were suffering a little on the baits he was using at the time. Being extremely pedantic about what bait he uses, Rob selected what he considered to be the best twenty bait companies around before ordering up small amounts of baits and painstakingly breaking them open, smelling, tasting, leaving to soak and all the other odd things us carp anglers do! 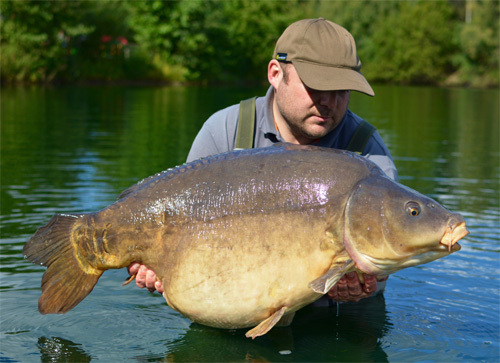 Essential Baits came out on top in Rob's tests and he ordered up his first batch of B5 in September 2014. His fortunes changed overnight, quite literally, and he hasn’t looked back since. His results have been remarkable with a consistent number of big fish, including a ‘forty’ from the mighty Burghfield on just his second visit! Dave is another highly experienced old school angler that is highly respected in all aspects of the specimen world. His appetite for fishing is second to none and he is what we call a proper angling historian. He has caught numerous carp from a variety of different venues for the past forty years and knows more than a thing or two about bait. Apart from being one of the most genuine people we have ever met, Dave is an extremely popular person and if you mention Dave’s name in any carp fishing circles up and down the country, they will all know him. We are extremely pleased to have Dave as part of our team and his help and feedback is invaluable. Martin is a prolific angler and a friend that we have a huge amount of respect for. Not only because he is an extremely competent angler who catches lots of big carp, but because he has morals and integrity. 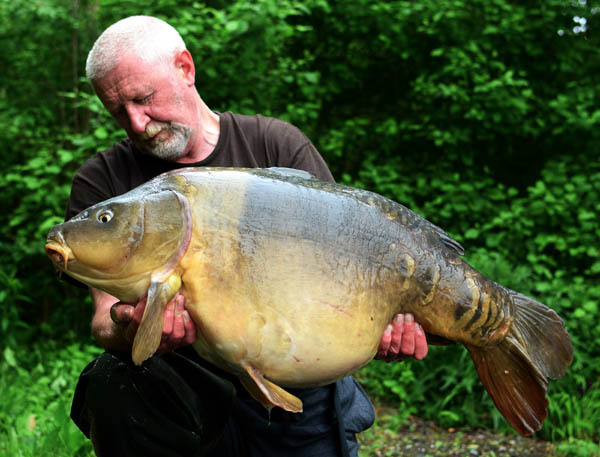 In fact, Martin will be including a chapter within Carp Life 2 detailing an extraordinary campaign at the famous Frampton Court Estate Lake where he managed to bank no less than three different 50's on the B5! Over the past few season’s Martin has targeted three different venues with great success on our range of bait and was responsible for the most prolific winter catch report ever recorded when he banked no less than six different 40's and eleven fish over 35lbs in just a few cold weeks in Jan/Feb on the Salami Cream! When it comes to catching very big fish on regular basis, few anglers can hold a candle to Dave and his results have been remarkable. Dave has been using Essential Baits for many years and we can remember him catching forty pound carp from difficult waters over a decade ago! Since then his results have just got better and better and he has banked three fifty pound plus carp this years alone, let alone several forties! He is a carp catching machine and he openly attributes much of his success to the awesome B5, which he says is key to his success. That’s typically modest of Dave, but there’s no doubt that the combination of good angling coupled with a good bait is a sure winner. Rich is a long standing member of the prestigious British Carp Study Group and has been around the carp scene for many, many years, boasting an astonishing amount of 30lb+ carp, quite possibly more so than any other angler in the country. When it comes to getting ‘up close and personal’ to your quarry, such as surface stalking or margin fishing, Rich is in an absolute league of his own and no carp is safe! This is great for us because it can provide valuable feedback on the carp’s reaction to our baits, but judging by the amount of carp Rich has caught since using Essential gear, we get the impression the bait doesn't hang around for too long! Lee is someone who just quietly ticks along doing his own thing without making too much fuss, but he certainly knows how to catch some of the big girls that don’t visit the bank too often. He’s been with essential for over 7 years now and during that time has caught some very impressive fish. Like most of us, Lee holds down a full time job and has limited fishing time, but his catches are highly credible. Lee has proved beyond all doubt that if you’re not in a position to compete with other anglers in terms of time on the bank, using a high quality food bait with exceptionally good food signals coupled with good angling ability will always keep you one step ahead. Any bait team line up would not be complete without its own residential ‘Gloebetrotter’ and Merv is exactly that man. 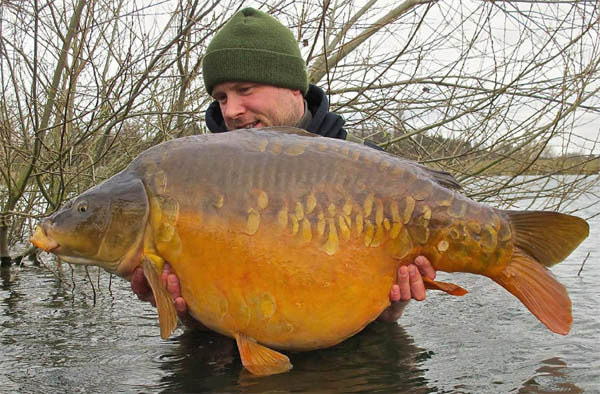 Having caught massive carp from all over Europe and as far afield as South Africa, he boats an impressive album of mighty fine carp that very few could compete with. The ‘free-spirited’ Merv loves his carp fishing and from our point of view, seeing the results Essential Baits achieve in all corners of the globe confirms that even on waters stuffed full of natural food, the carp will continue to recognise a good food bait. It’s great to have Merv on board, both in terms of feedback and of course to see a steady stream of enormous carp to well over 80lbs! Whilst I still believe the original recipes we produce are still the best ones to use for most situations, I can see why our custom bait rolling department is so popular. It gives you the chance to use the very best food baits available, but with a completely different attractor package to what most others are using. This can be useful if you feel others may take advantage of your baiting campaign or it could simply be down to the fact that you just want something a little different. We have listed some good examples but feel free to email me if you want something different again. We even have customers sending us their own attractor packages to incorporate into the bait, which of course we are happy to do with complete confidentiality guaranteed.